Backyard trampolines are a sure way to get your children outdoors so that they can use some of that natural energy, get the blood flowing, and release steam. The best large backyard trampolines allow you to enjoy quality time with your kids- believe us, it’s a great bonding experience. But what is the best backyard trampoline in the market? Well, narrowing down to a single model from the hundreds (if not thousands) of options available today is going to be a daunting task. That’s why we’ve selected 7 of the top-rated tramps to make your task easy. Our first contender for these backyard trampoline reviews is the Songmics outdoor trampoline for kids. This 15ft trampoline comes with an enclosure net, an anti-UV, wear-resistant, and polypropylene jumping mat, and a sturdy frame structure of galvanized steel that’s able to resist premature rusting and corrosion. One of its best features is its 375 pounds single-user weight limit which is much higher compared to other trampolines of the same size. With the basketball hoop and 108 7-inch galvanized springs for good elasticity and bounce, the Songmics is bound to give you hours of fun playing with your child on the trampoline. Another highlighted feature is the safe jumping space created by the high quality enclosure net, the tightly fixed rails to the legs using eyebolts, and the wide spring cover pad that comes with an overhang for maximum safety. It is approved by TUV Rheinland with accordance to the ASTM and GS standards and has been certified as safe and reliable for use by children and adults alike. The biggest concern for most parents is trampoline safety which is heightened by the increased reports of injuries emanating from spring-based trampolines. But that’s the main issue that Springless trampolines came to solve. Just as the name suggests, the Springfree 11 ft large square trampoline has no springs! This is the most eye-catching feature for this product. Instead of springs, it uses flexible composite rods which sit beneath and around the jumping surface (same as the frames) well out of harm`s way. This indeed reduces the risk of injury by up to 90%, giving you peace of mind as your kids happily jump on the safest trampoline for backyard. Should a jumper lose their balance they will land on the FlexiNet safety net enclosure which will cushion them and propel them back to the jumping mat. The trampoline has a jumper’s weight rating of 250lbs and is built with superior quality materials (double powder coated galvanized steel frames, UV treated, PP net and mat, and composite fiberglass rods) that can withstand the harshest of conditions giving you years of great fun and service. It comes with a FlexrStep (ladder), a FlexrHoop (basketball hoop) and is the world`s first smart trampoline with a digital game system that has over ten games and applications for body and mind exercise. The Skywalker 15 ft jump N` dunk is the most popular trampoline from the Skywalker. It provides hours of fun slam-dunking and jumping. Your kids get to jump, shoot and dunk as they play basketball while enjoying fresh air and feeling like Michael Jordan! It stands at 143 sq. ft and accommodates up to 200 pounds of weight. The galvanized frame and legs are strong and sturdy at 16 gauge. 96 tightly-coiled springs each measuring 6.5 inches long, on the other hand, give this trampoline a good and safe bounce. There are enough safety and fun features including a no-gap enclosure system, which eliminates all pinch points and openings. This trampoline backyard also ships with a polyethylene enclosure net that has been tightly woven to ensure no toes or fingers are caught in it while the rust-resistant galvanized steel frame and legs and the soft spring padding offer maximum safety while dunking. This product meets and exceeds all ASTM standards, and comes with a 3-year limited warranty. This rectangle backyard trampoline is one of the safest backyard trampoline you will find. Standing at 40” from the ground, and measuring 10ft by 17ft, this trampoline features a blue spring/frame pad with high density foam used all around the surface. The padding is 1 inch thick and 17 inches wide for maximum protection. The jumping mat is thickly stitched, high density and UV protected. The 12 gauge frame is strong and sturdy and the safety poles come with vinyl pole sleeves for added protection. Another outstanding feature about this trampoline is that it offers a large jumping area with StageBounce technology for that extra bounce while offering safe landing. Rectangle trampolines have more jumping space compared to round ones and are generally bouncier. The Jumpsport StagedBounce comes with 108 extra-long pro-stretch, high performance springs that offer the jumper smooth rebound and shock absorption. The high number of springs gives the trampoline a better bounce compared to others with fewer springs. In addition, instead of using a zipper for the entryway, it has an overlapping doorway design which eliminates the risk of your child slipping through and falling out. The patented triple-fail-safe enclosure net is tried and true. Regarding durability, this trampoline is an all-weather, durable product that your family will enjoy for years to come. 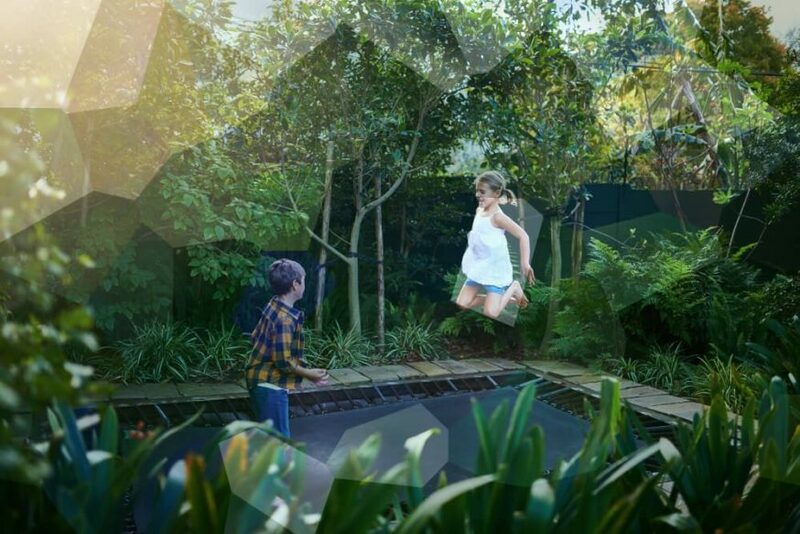 The model is among the latest backyard trampolines from the Skywalker manufacturer and doesn`t take up too much space because of its square shape. Surprisingly, it offers a jumping room almost equivalent to what a 16” round trampoline has. As mentioned in the best backyard trampolines buying guide later in this article, square trampolines will easily fit when placed near corners as opposed to round ones which is a huge relief for homeowners will small or ill-shaped backyards. The enclosure net is made of polyethylene and attaches directly to the jumping mat and to add on that, thick camouflage padding is laid on top of the spring system. This helps to minimize the risk of injury while jumping. Speaking of the spring system, the Skywalker 14” square trampoline is blessed with 96 thick steel springs that definitely make it one of the best backyard trampolines for gymnasts. Just like its sibling the Skywalker Trampoline 15FT Jump N` Dunk, this one also features galvanized tubes for frames and legs giving you a sturdy, well-balanced structure, with rust-resistant qualities. For added stability, the legs and frames are interlocked using t-sockets. The round SkyBound stratos trampoline ticks almost all the checkboxes when it comes to safety and great features. In addition, we cannot deny that this backyard trampoline has the most eye-catching design in these reviews. The high-density enclosure net with a concave design is perhaps the most easily notable feature of this fun tool. It keeps jumpers safe by propelling them back to the jumping mat, while the 12 galvanized and padded pole support the net from outside. One of the brilliant features on this trampoline is the push-pin bolt technology and machine welding it has been engineered with. This backyard trampoline with enclosure has 0.1-inch thick gauge steel and its springs are 50% more durable and bouncier compared to standard springs. The springs, each measuring 8.5 inches long are first treated in ionized zinc (black powder coating) for premature corrosion and rust prevention and are easily distinguishable from others because of their bright gold color and rubber-capped spring hooks. The other amazing fact about this product is the warranty plan. SkyBound covers the metal frame for 10 years, the springs and net for 1 year each, the jumping mat for 2 years and finally the cover pad for 6 months. In other words, longevity is a guarantee with this trampoline! This ensures loads of fun for years to come. Looking for a small backyard trampoline? Zupapa- a Germany-based trampoline manufacturer has something you might want to check out. Like all other Zupapa trampolines, the Zupapa 10ft is TUV certified, which means that it has been comprehensively tested for materials’ chemical composition to ensure maximum safety for your family. This trampoline stands at 7.8ft from the ground with ample jumping space (8.7ft in diameter) and a net height of 5.4 ft. The mat is made of polypropylene (PP) and is UV protected. The 1.66 inch by 1.5 tubes are galvanized and together with the high quality hot-dip deep galvanized frames for a sturdy structure. Although its 10-foot diameter suggests that it is a kid’s only thing, this trampoline’s 330 pounds weight capacity means that you can also join in the fun with your kid every now and then. It also means that several kids can ride on it although we don’t recommend this for safety reasons. The frame come with a 10-year warranty and the jumping mat, springs, safety pad and enclosure net get 2 years each. In case of a defective part, it will be supplied without charges. There is no discussion or argument on the importance of ensuring your safety and that of any jumper that will be enjoying the trampoline. As in any case, safety comes first. This you will do by ensuring that you choose a trampoline that features no-gap enclosure system and padding. The enclosure net must to come directly to the edge of the jumping mat so as to keep any gaps outside the jumping area. Gaps are a risk for limbs being caught or little fingers and toes being pinched. The poles and the surface around the jumping area must be padded so that no room for injury is left. It’s also important to give more consideration to a trampoline that meets and probably exceeds the safety standard measures of a recognized independent certification institution. When choosing a trampoline for small backyard, consider the size and shape of where you plan to place the trampoline once you purchase it. Square trampolines are easy to place near corners, while rectangular and oval ones can be placed in tight and narrow spaces compared to the more popular round trampolines. The size of your backyard and your budget will help you zero-in on the best trampoline for you. Trampolines for backyard are quite impractical to disassemble during bad weather. That’s to say that they are bound to remain erected throughout the year. That being said, consider carefully the materials used by the manufacturer. Go for materials that can withstand weather elements like the sun, rain and wind. Galvanized and powder coated steel frames and springs are sturdy and can withstand the toughest of conditions and, therefore, last very long. Go for UV protected materials, polyethylene enclosure nets and polypropylene or geo-textile jumping mats. This provides for the safest backyard trampolines with high quality materials and guaranteed durability. Trampolines are getting more and more revolutionary with each passing year. While some accessories come with the trampoline from the factory, there are others that you’ll need to buy separately. There isn’t a stipulated list on what accessories should come with every trampoline. For instance, some will come with the enclosure net while others won’t. One important item that most manufacturers don’t include is the ladder despite its significant safety contribution when the jumpers are getting on and off the trampoline. So, double check to see what is included in the package to determine what you need to add. It is very important to set up a budget before going to the store. Decide on the most important features to you such as weight capacity, basketball hoop and jumping height. Trampoline prices range from as low as a couple hundred dollars to as high as thousands of dollars depending on the level of innovation and technology. Worth mentioning is that some of the best bargain trampolines are not necessarily pricey! As we conclude this article, we hope we were of help to you in deciding on the best trampoline for your family. First, we`d like to recap and emphasize on the importance of safety features of the product you decide to take home. Three things to look out for in terms of safety are no-gap enclosure systems, thick padding, and strong enclosure nets. Secondly, look out for high-quality and durable materials such as galvanized steel frames, rust-resistant springs and high-quality mats and nets that won`t tear or rip in no time. Thirdly, consider the space available to place the trampoline so that you can decide on the size and shape of the trampoline you`re going to purchase. And finally, set up a budget of how much money you are willing to spend on the purchase. Importantly, remember that just because it is pricey, it does not necessarily mean that it is the best backyard trampoline.